Hello everyone? How's you Christmas? Merry Christmas! Me, i started this morning in church and had myself a Christmas mass!. My memory of this Christmas is when as the offerings are on-going, my church mate sings "Have yourself a merry little Christmas" , i can really feel the Christmas as she sangs the song, i love Christmas for this day gave me lot of adventure, foods and presents for my God-daughters and from my loved-ones. I have lots of plan posts, but i just don't have the time to post 'em here, actually i suppose to post this entry last night but anyways, at this time we may knew the results of MMFF, i will still do my own rankings of movie entries for this year. I really find the movie-entries of MMFF for 2010 excellent 'cause even me have having a hard time choosing the best movie for this year compare to the previous years of MMFF. Let's start the rankings, i'll just do my top 6, ready? 6.Father Jejemon - though this movie gone such issue about the holy sacrament, this still deserves to be viewed for the lessons (as said as the description of the movie) this movie gives. Because of the issue the movie had, still the king of Philippine comedy have shown his being as an artist, his stand as the one who takes the whole responsibility of the movie and most especially him as being a responsible follower of Christ. Let's support this for the lessons of the movie will bring and as a support to the one and only comedy king of the Philippine entertainment! 5.Agimat at si Enteng Kabisote - Yes, the two kings combined and for sure, as what everybody says, that this movie will hit the box-office and will be the top-grossing movie of 2010 MMFF. For me, i will still choose to watch the movie that i think will give me satisfaction and gives me the taste of hard work, history, sense and art. I am not saying that this movie don't have those for i know the stunts, the costumes and the set are really custom made, it is just that, this movie has been already, every year, there are only different kinds of twist but still somehow, the story is the same. This is just not my taste of film but still a must-see movie for the two kings worked together to give us the taste of comedy, action and magic!. 4.Dalaw (Visit) - Kris Aquino. I like her. Most of the people don't, ahahaha. I don't know but maybe because for me she have proven herself in the last horror movies she made, that are really box-office and for the stories are original, the twists, the story-line itself. The cast is not that powerful but for i now this is something a worth-see for the mystery the story gives, this movie gives me these questions on my mind " Who's that someone following her? and want to give her a visit?" and " What's the mystery of kris aquino's character?" 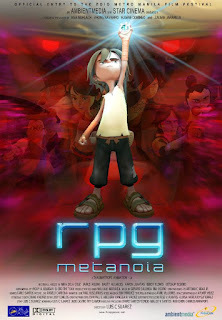 3.RPG Metanoia - I AM SO AMAZED. For those in the field of animation, IT, 3D and virtual arts, we know that this is something hard to make, this is something FIRST!, and something that the Philippines has to be proud of that the Filipino's Can just like the other country can. Lately, i am using Google sketch up and i know how hard to make 3d things, in sketch up the objects are down-loadable but here!, everything are custom made. As far as i know, they even used orchestra (i just can't remember from which university the orchestra from) for the scoring of the movie. Must-see? YES, DEFINITELY not just only focusing on the story but how great and wonderful the Filipinos made this movie!. 2. Tanging-Ina (Last na 'to) - From the part one of this movie, the story is really something touchy that how the mother will do everything just to give her family a decent life. Part two, the sacrifice again of a mother of the country (as the president) and whom to choose? her family or the country that she is servicing of?. I am such a fan of Ms. Ai-Ai de las alas cause of her sense of humor, she, as being true to herself, her sense of comedy, everything. Now, the last part of the movie has come, and i am glad that after her struggle in giving her family a living in part one, now, i think she has already able to give it to her family, she became successful. This is it!, this is really really is it is it! 1. Rosario- OH. 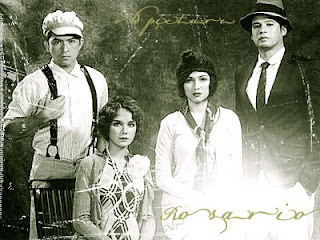 Speechless for i think this movie will get all the awards in MMFF, all i can say is excellence!. I mean everything is very powerful, 5 years in the making, the set, it's something that we can compare to Titanic and other vintage-like movies ever made, and now Philippines again have able to make one and something to be proud of. The costume, the cast, the setting, the era, haaaaay, i'll just get tired of enumerating for how i think the movie is such in the highest form of art!. This is my number one, this is something worthy!. OH MY GOSH!!!! We have the same number 1 movie... This will be the only movie that I will be watching from the MMFF this year... I am so excited to watch it on the 28th since we dont want a mob when we watch the movie! =) Nice choice of movies though... =) But I am all in for ROSARIO! Hmmmm...sa mga pelikula na nasa listahan mo eh I will not watch Father Jejemon. Pahabol pa pala...I highly recommend na huwag panooring yung "Super Inday and th Magic Bibe." Napaka-low-class ng pelikula. Wow. Cool movie list!^^ Lolwut, Father jejemon. I must try that XD Sounds cool. Dapat manonood kami nung 26 kaya lang ang daming tao. Happy Holidays!